The Arizona Section of the Canyonlands & Four Corners Travel Guide includes Monument Valley Tribal Park with its famous vistas and monoliths; Petrified Forest National Park where you will find the finest views of the Painted Desert; Navajo National Monument and Canyon de Chelly National Monument with their outstanding Ancestral Puebloan - Anasazi cliff dwellings; and contemporary Hopi and Navajo cultural sites. Rainbow Bridge hiking information is also available. This guide offers descriptions of many points of interest, links to many references, travel itineraries, and suggested visit times. Navigating the Guide - Open the Locater Map, or use the Pull-Down Menu, or the Canyonlands & Four Corners Travel Guide Index at the bottom of the page. 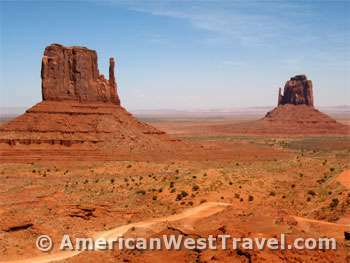 Monument Valley and the surrounding area offer some of the southwest's most famous and unusual scenery. The wide-open landscape filled with mesas, buttes, and stone monoliths has been featured in many of America's greatest western movies. The park is operated by the Navajo Tribe. For an admission fee, visitors may stop at the Visitor Center and take a self-guided tour on the 17-mile main park road. To delve deeper into the park and see some of its best attractions, one must purchase a guided tour. Tours are by horseback, jeep, or hiking and showcase exquisite monoliths, windows and arches, Anasazi ruins, and Navajo culture. See links below for tour information. The park has a campground. In season, native vendors sell arts and crafts, and the Visitor Center serves food. The nearby Gouldings Trading Post offers complete tourist services. The new Monument Valley View complex within the Tribal Park offers a hotel, restaurant, trading post, and tours. The park entrance is off of US-163, just north of the Arizona border. Visit time: a few hours to a full day or more if you take a guided tour or go hiking. Canyon de Chelly is one of Arizona's most spectacular canyons with some of the finest Ancestral Pueblo cliff dwellings and rock art. It is one of North America's longest continuously inhabited places, presently occupied by the Navajo people who work the land and also partner with the park service in managing the canyon's cultural resources. Access is by guided tour only, with options including hiking, jeep tours, and horseback riding. The Thunderbird Lodge has long offered tours on open six wheel drive trucks. You can also arrange to hike or horseback with a Navajo guide. There is no charge to stay at the campground. The canyon is off of US-191 near Chinle, Arizona. Visit time: a tour will take most of a day; expect to stay over for one night. The Hubbell Trading Post has been serving the Navajo Reservation for over 100 years and is still in operation to this day. The historic site includes the trading post, the historic Hubbell home, and a visitor center. Navajo weavers demonstrate their craft on-site. Tours of the home are available for a small fee. The site is near the town of Ganado on US-191, 35 miles south of Canyon de Chelly. Visit time: an hour. The Hopi people largely occupy a series of high mesas on their reservation in northern Arizona. Most notable are the ancient towns of Walpi and Old Oraibi, one of the oldest continously occupied towns in the country. The Hopi are skilled in various crafts including pottery, weaving, silver jewelry, and Kachina dolls. The best place to start a visit is the Hopi Cultural Center on Second Mesa at the intersection of Arizona-264 and Arizona-87. Visit time: Check with the Hopi Cultural Center about attending religious ceremonies that are open to the public. Navajo National Monument protects three ancient cliff dwellings. Daily tours are offered to Betatakin and Keet Seel during the summer. The guided hike to photogenic Betatakin is five miles roundtrip. The hike out of the canyon is strenuous. Keet Seel is considered one of the best preserved of all cliff dwellings. Very limited guided tours of Keet Seel are available - 20 people per day. You must hike out to the site on your own, 8.5 miles each way, and you may stay one night at the small campground near the ruin. The trip is recommended only for strong hikers (but is well worth the effort). Limited off-season tours are available. For more information, call (928) 672-2700 or visit the NPS site (below). Shorter scenic trails are also available. Visit time: for Betatakin, a half day; for Keet Seel, a very long, full day or overnight. Rainbow Bridge, the largest known natural bridge in the world, was once one of America's most remote and mysterious wonders. Since the creation of Lake Powell, many thousands of tourists visit Rainbow Bridge every year by tour boats from Wahweap Marina. It is still possible to capture the romanticism and adventure of visiting Rainbow Bridge by hiking overland, following the footsteps of the early adventurers. Two trails circumvent Navajo Mountain on a remote section of the Navajo reservation. The trails are steeply downhill to Rainbow Bridge. The ideal arrangement would be to be dropped off at the trailhead, and picked up by boat at the Rainbow Bridge tourist dock. An excellent adventure, but complicated logistics. Consult with the National Park Service ranger or Navajo Parks when planning this trip. A Navajo hiking/camping permit is required. Visit time: two or three days to hike; half to full day for boat tour. The Canyonlands region of southeastern Utah features Arches and Canyonlands National Parks. This area of Canyon Country has its own unique look, featuring many arches, windows, fins and other erosional oddities. This is due to the soft Entrada sandstone which predominates here. Four Corners Region Travel Itineraries - Trip Planners.